When the Financial Times complained last September that the BSkyB takeover would give Murdoch a media dominance in Britain, the media commentator, Roy Greenslade, came to his rescue. “Surely,” he wrote, “Britain’s leading business newspaper should be applauding an entrepreneur who has achieved so much from uncompromising beginnings?” Murdoch’s political control was a myth spread by “naïve commentators”. Noting his own “idealism” about journalism, he made no mention of his history on the Sun and later as Robert Maxwell’s Daily Mirror editor responsible for the shameful smear that the miners’ leader Arthur Scargill was corrupt. (To his credit, he apologised in 2002). Greenslade is now a professor of journalism at City University, London. In his Guardian blog of 17 July, he caught the breeze and proposed that Murdoch explain “the climate you created”. How many of the political and media chorus now calling for Murdoch’s head remained silent over the years as his papers repeatedly attacked the most vulnerable in society? Impoverished single mothers have been a favourite target of tax-avoiding News International. Who in the so-called media village demanded the sacking of Sun editor Kelvin MacKenzie following his attacks on the dead and dying of the Hillsborough football stadium tragedy? This was an episode as debased as the hacking of Milly Dowler’s phone, yet MacKenzie has been frequently feted on the BBC and in the liberal press as the “witty” tabloid genius who “understands the ordinary punter”. Such vicarious middle-class flirtation with Wapping-life is matched by admiration for the successful Murdoch “marketing model”. On 13 July, the Guardian editorialised about “the knowtowing of the political class to the Murdochs”. This is all too true. Kowtowing is an ancient ritual, often performed by those whose pacts with power are not immediately obvious but no less sulphuric. Tony Blair, soaked in the blood of an entire human society, was once regarded almost mystically at the liberal Guardian and Observer as the prime minister who, wrote Hugo Young, “wants to create a world none of us have known [where] the mind might range in search of a better Britain …” He was in perfect harmony with the chorus over at Murdoch’s Wapping. “Mr. 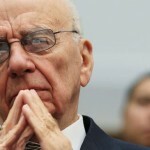 Blair,” said the Sun, “has vision, he has purpose and he speaks our language on morality and family life.” Plus ca change.